Give your BMW's interior a more appealing look with some carbon fiber trim pieces that will make your car stand out. Your passengers will definitely want to take these carbon fiber pieces as soon as they lay their eyes on them. The 3K Twill weave will make your BMW a much more unique with its signature appearance that is highly desirable for modern cars. 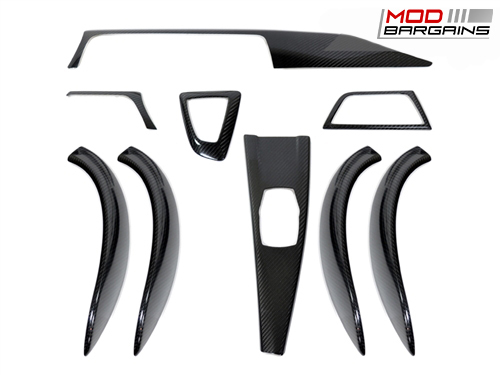 These Dry Carbon Fiber Interior Trim kits are only compatible with the 2013 and up BMW F30, F31, F34 3-Series. You do not have to remove your original interior trim as this kit comes with 3M adhesive for a quick and easy installation, so you can keep your original interior while enjoying the style that carbon fiber provides. This 3K, 2x2 weave offers an excellent glossy surface while offering great ultimate strength.